I've always thought that the back side of Flo's V8 Cafe was pretty complex and detailed, considering the fact that it was not the primary facade. 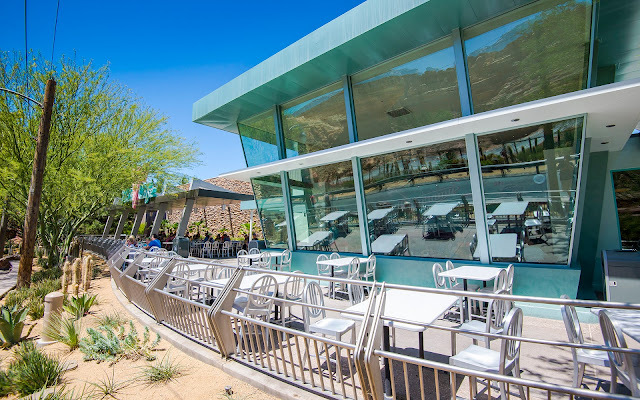 Granted, it has to compete with standing right across from Willy's Butte, Radiator Springs Racers, and the beautiful Firewall Falls, but still--a lot of design and effort has gone into this part of the restaurant! There's canted glass, sleek overhangs, lovely turquoise, warm clad stone, and a nifty little shade structure all along the walkway, integrated into a lovely outdoor dining area that provides a fantastic atmosphere. Little touches add up, and the result is a wonderful contribution to the immersive environment that is Cars Land! The sleek and stylish facade of Flo's V8 Cafe, but on the Ornament Valley side.